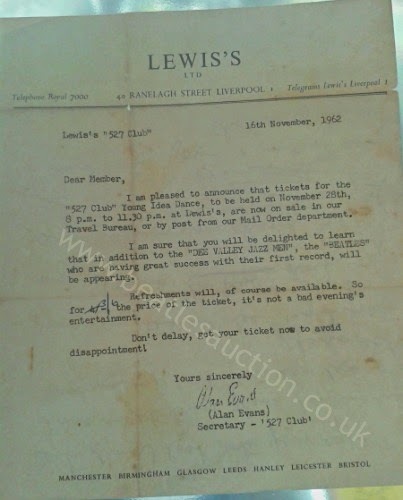 You may recall that in the 2013 Liverpool Beatles Auction we had a rare ticket for the Beatles appearing at Lewis's Department Store in Liverpool. The ticket sold for £3550. This letter to members of the 527 Club dated 16th November 1962 mentions that very event. There is even a hand written amendment to the price of the tickets from 4 shillings to 3/6! The letter is going to be one of the lots in our 2014 event and carries an estimate £75-£100. 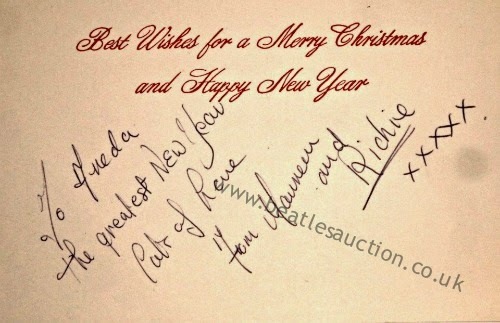 Up for sale in our next Liverpool Beatles Memorabilia Auction in August is this Christmas Card from Ringo and Maureen. It was written by Maureen and features a message "To Freda, the greatest New Year, lots of love from Maureen and Richie xxxxx"
The estimate on this item is £250-£300. 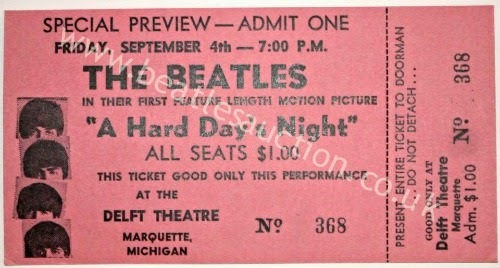 A complete ticket for a viewing of the film A Hard Day's Night in Marquette, Michigan, USA. 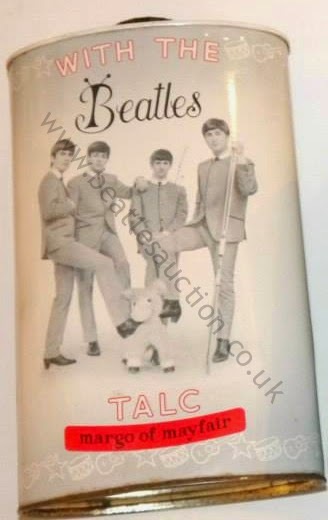 The 2014 Liverpool Beatles MemorabiliaAuction takes place on 23rd August 2014 at the Paul McCartney Auditorium at The Liverpool Institute for the Performing Arts. Items are being taken in for this year's event at The Beatles Shop on Mathew Street. Please check the contact page for details of how to get in touch with us regarding valuations of any items you may have and the availability of our valuer. All valuations are free. 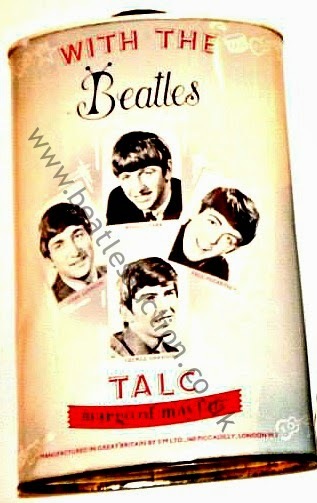 Margo of Mayfair produced tins of Beatles Talc in 1964. 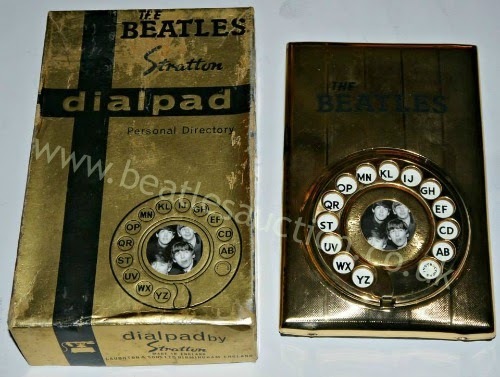 The photos show both sides of the same tin (please note there was a difference in lighting) Once upon a time these were regular items in our Beatles memorabilia auctions but we are seeing less and less of them these days. 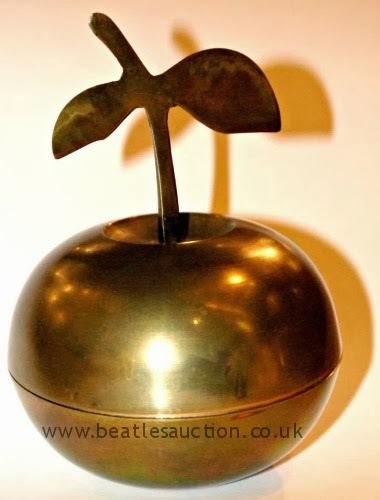 Apple Records handed out brass apple paperweight/trinket boxes to family and friends. 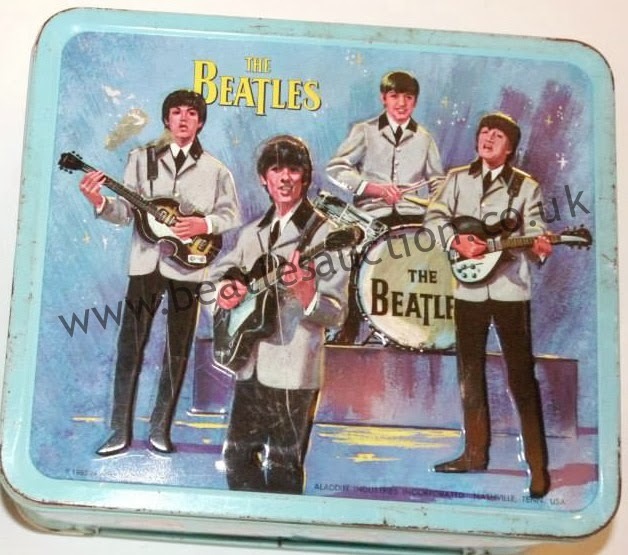 1965 Beatles Lunch tin made by Aladdin Industries Inc. Nashville Tenn. USA. 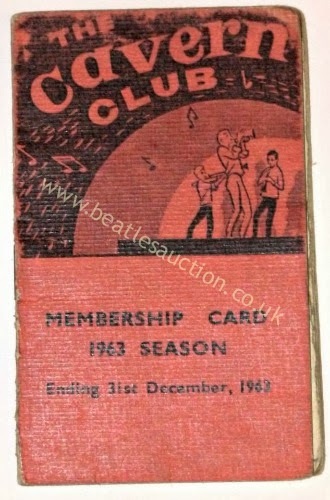 It's quite unusual to find items that date from 1965 as most of the memorabilia dates from the initial 1964 Beatle boom. 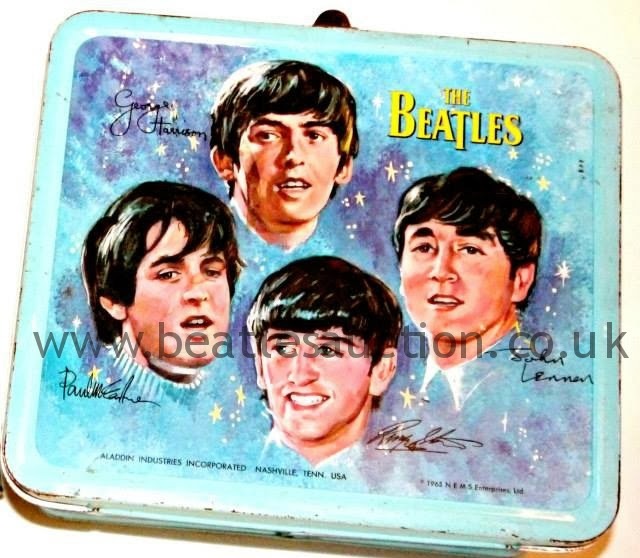 The estimate on this lunch tin is £150-£200 and it will be sold in our Liverpool Beatles Auction in August. 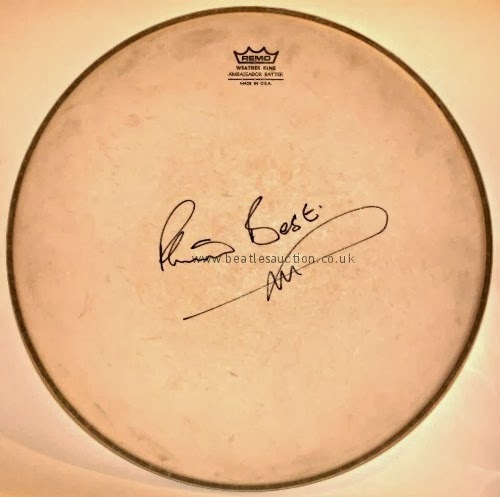 This signed drum head will be sold in our 2014 Liverpool Beatles Auction this August. These Cavern Club pens from the mid-sixties feature three bands that regularly played at the venue - The Kubas, The Hideaways and The Notions. 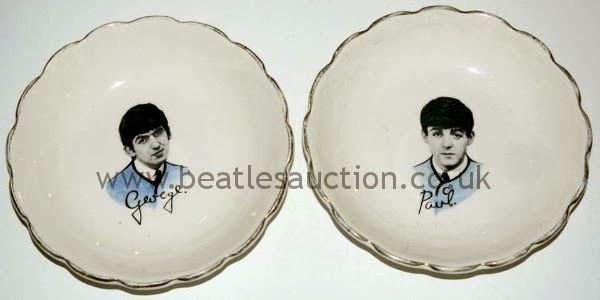 They will be sold together in one lot at our 2014 Liverpool Beatles Auction this August. The estimate is £60-£70. John, Paul, George and Jimmie. An unusual set of Autographs. 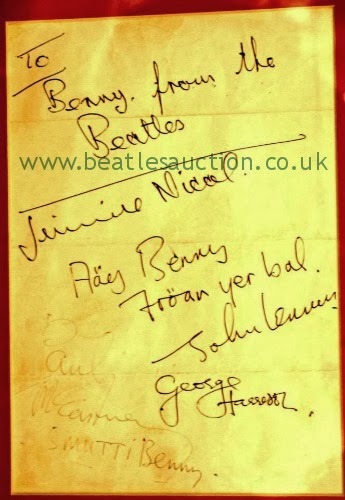 This set of Beatles autographs features four members of the band, but not the four you may expect. They date from the time that Jimmie Nicol was standing in for an ill Ringo Starr. Greetings have been added by Jimmie, John and Paul. Jimmie was with the band for a short time in June 1964 while Ringo was treated for tonsillitis. 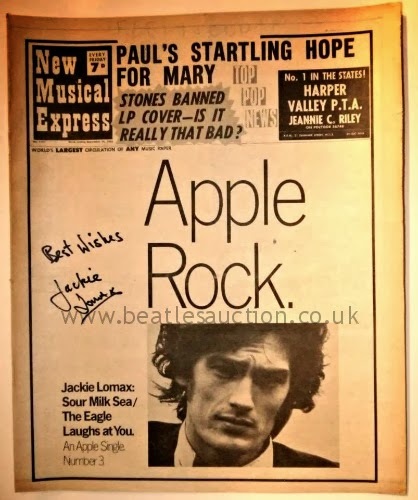 Items are coming in thick and fast for the 2014 Liverpool Beatles Auction this August, so before there is a barrage of all new posts here is a quick round up of items that have already been covered so far. Fan Club Christmas Flexi discs 1966, 1967, 1968, 1969. Birthday Card signed by Mike and Paul McCartney. St Joan school play programme from Liverpool Institute. In His Own Write and Spaniard in the Works by John Lennon. Cellarful of Noise by Brian Epstein. Mersey Beat magazine with McCartney cover. Concert tickets for Newcastle December 1965 and Hammersmith Odeon January 1965. Cavern Club Mug and mug decals. Ticket for Last Night of the Cavern Club 1973. 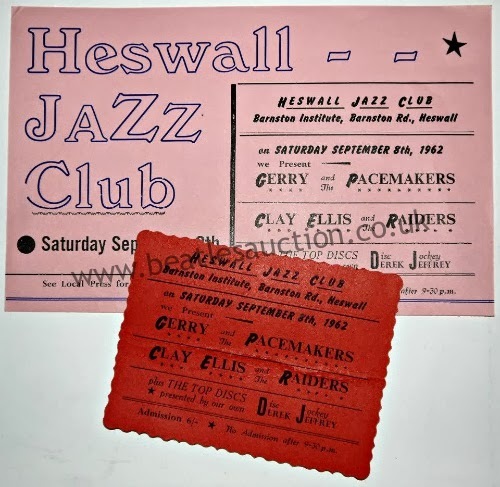 Handbill for The Beatles at Heswall Jazz Club. 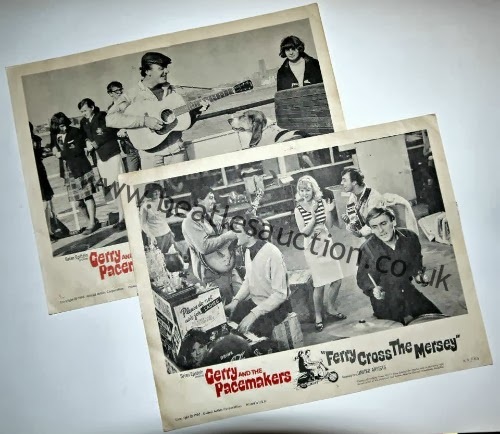 Gerry & The Pacemakers Handbills, tickets and lobby cards. 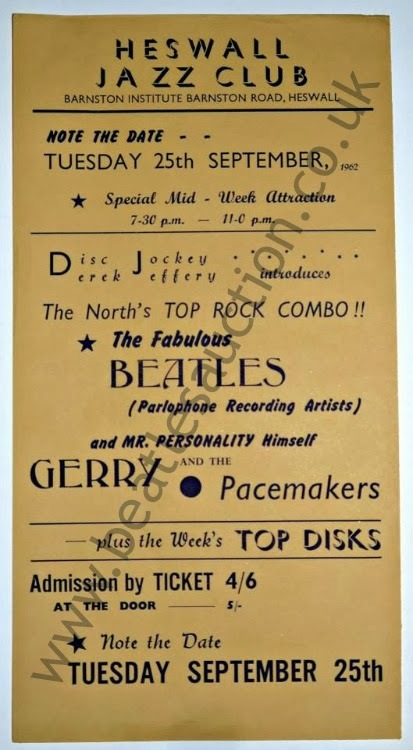 Handbill for The Beatles at Liverpool Jazz Society (later The Iron Door Club). Washington Pottery mugs, plate and dish. Phew! And that's just the stuff we've covered so far! There's more to come. Washington Pottery items are always popular. 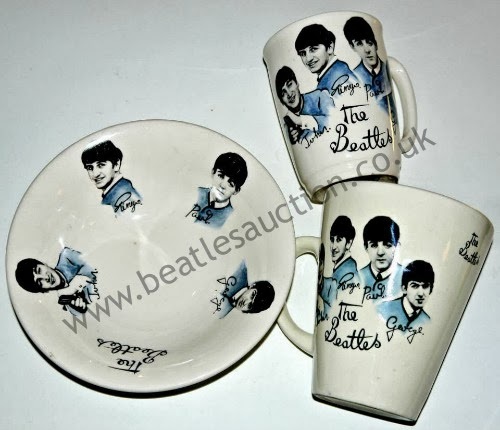 They feature regularly in our Annual Liverpool Beatles Auction and usually do very well. They are nice things to start off a collection as they tend to be affordable and look fabulous on display. The biscuit plate below is complete with the original cup. 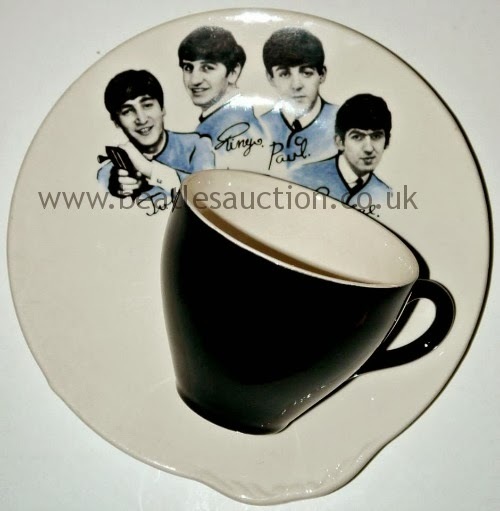 People sometimes think the plates were for the mugs carrying the familiar blue Beatles transfer, but the proper cup is plain black. These two candy dishes are being sold together in the same lot. One George, one Paul. The items below are all being sold in separate lots in August. The Liverpool Jazz Society made their home at 13 Temple Street, it later became The Iron Door Club. 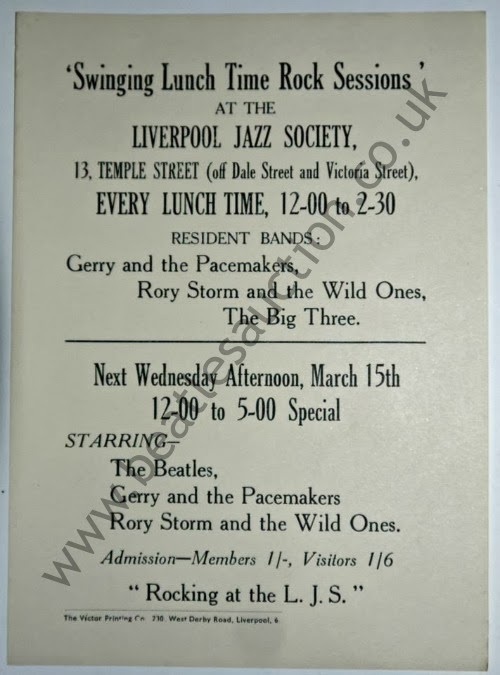 This handbill/flyer was to advertise their lunch time Rock Sessions and special longer rock session featuring The Beatles, Gerry & The Pacemakers and Rory Storm on March 15th. 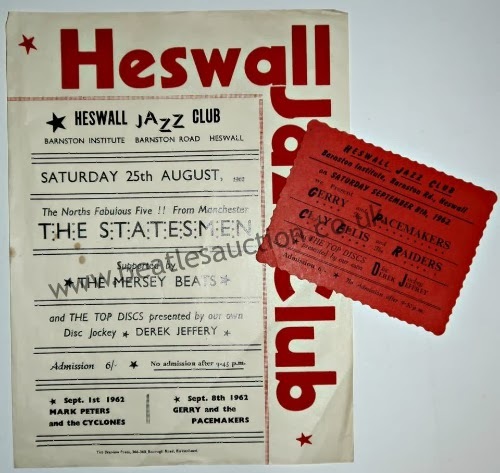 This rare handbill for the Beatles at Heswall Jazz Club, 25th September 1962 will be sold at our next Liverpool Beatles Auction to be held in August. Handbills are items that tended to be discarded after the event and this makes them very collectible. The Beatles became the most famous band from Liverpool but they certainly weren't the only band from the city. There's always interest in the other bands from the time. 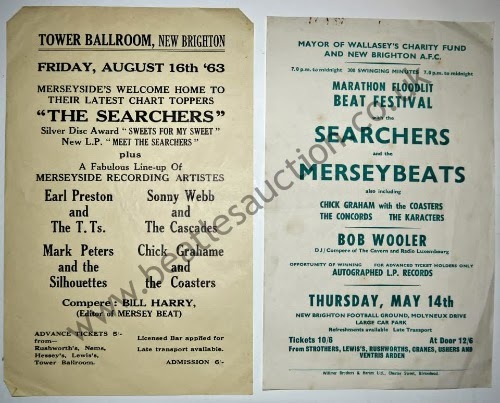 These two handbills are for concerts by The Searchers. 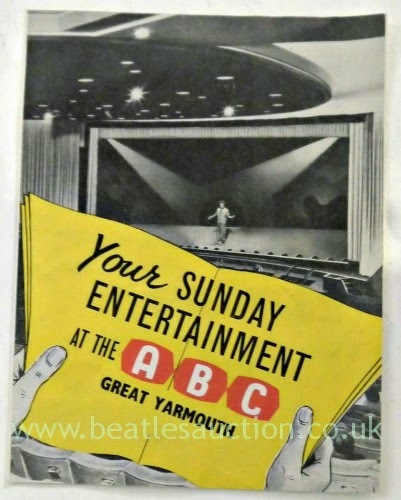 Both are for events in New Brighton, just across the River Mersey from Liverpool. 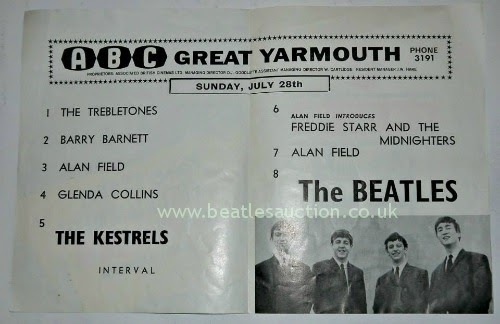 They are being offered together in one lot in our next Liverpool Beatles Auction. The estimate is £50-£60.